Go Smart with MiJET - Techna Tool Inc. Go Smart with MiJET - Techna Tool Inc. Effectively cleaning a production CNC machining facility can be a daunting task, especially with the rising importance of eco-friendly cleaning requirements. While there are a few wash down equipment providers in the industry, what sets MiJET apart from the competition? MiJET is a higher quality cleaning alternative that was designed to solve the problems experienced from chemicals and particles. MiJET applications and service is completed by long-tenured process and tool monitoring expert, Techna-Tool. Air Driven: Significant eco-benefits and cost savings over electricity-driven systems. 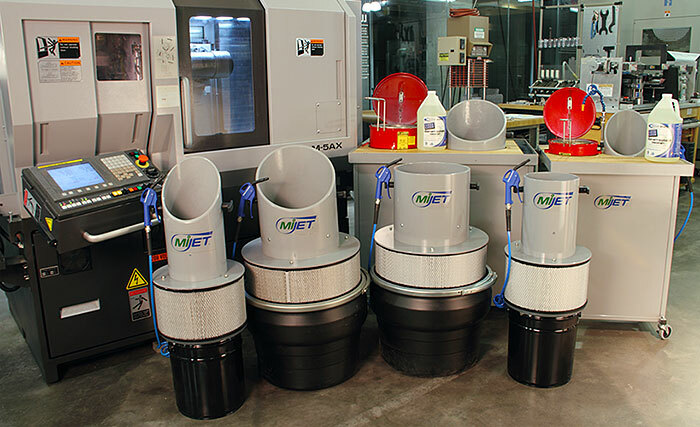 MiJET is entirely compressed air driven and can be easily connected to any air line in the CNC facility through FNPT 1/4 ʺ fitting. Withstands the Harshest Work Environments: The MiJET wash down station is designed for harshest work environments. The machine uses a suction pump for capturing aerosol mists, which are known for causing breathing problems, and other health issues among people working in manufacturing facilities. Also, it helps reduce settlement of debris on floors, and machine parts, thereby reducing the chances of accidents due to slippage. Simple Touch Operation: The one-touch operation makes the system highly user-friendly A part can be held over the large opening and is cleaned by simply pulling the air nozzle trigger. With one touch, a steady volume of air is produced. Small Footprint, Portable Solution: The MiJET system is available in three models –14ʺ, 34ʺ, and 38ʺ diameters. With all models weighing under 32 lbs., it is a truly portable cleaning solution. Allows Recycling: The machine is fitted with a debris harvest bucket, which captures heavy debris. This bucket can be easily detached from the equipment, allowing CNC machine operators to reuse expensive coolants or materials. Minimal Maintenance Needed: The MiJET air-driven washing station requires minimal With a little lubricating oil every month, the system will work for years. Talk to an expert at Techna-Tool should you have a question or proposed application for MiJET. This entry was posted in MiJET. Bookmark the permalink. ← What Makes Hirth Gears so Popular?